WASHINGTON—Standing on Capitol Hill, before a rally of witnesses, 19 more Chinese people publicly declared their withdrawals from the Chinese Communist Party (CCP) and its affiliated organizations last Friday. Their action was inspired by the Quit the CCP or Tuidang movement, which has resulted in over 120 million Chinese people withdrawing from the CCP by issuing personal statements online, in person, and via fax, phone, or email. 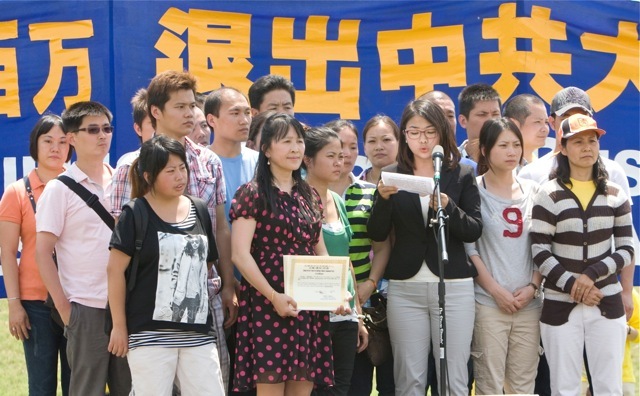 Sun Hongyan, a human rights activist who came to the United States six months ago as a student, stated her renunciation before a huge crowd with 1,000 people waving banners of support. While in China, Sun helped people who had been forcibly evicted from their homes because of government-sponsored construction projects. She also assisted children diagnosed with deadly diseases whose parents could not afford medical treatment. On Capitol Hill, Sun expressed a sense of helplessness as she talked about fighting for human rights in China. “I found out that those who stood in the way were not businessmen who were eager to develop projects and make money, not people who did not follow the law, but the government who was doing bad things under the banner of ‘serving the people.’ Even the safety and rights of activists are violated. In the end, we ended up fighting for our own rights,” she said. Sun was a member of the Youth League and the Young Pioneers, communist organizations used as channels by the communist regime to spread its widely publicized propaganda to students. After she came to the United States, Sun read the Nine Commentaries on the Communist Party, published by The Epoch Times in late 2004, and said she became clearer on the importance of exposing the CCP’s evil acts. The book tells the history of China and the destruction it suffered after the communists took over in 1949. It is the driving force behind the Tuidang movement. Sun called on Chinese people to stand on the side of good in the face of what she called “evil tyranny.” She personally felt proud to be part of the Tuidang movement. “Let us welcome a new China that is free from the control of the Communist Party,” she said. Mr. Li from Fujian Province was also among the crowd of people who withdrew from the CCP on July 13. He recounted his experience in 2004 when Chinese officials confiscated his house and sold his land. “When farmers do not have land, we lose the most essential source of income,” he said. Yi Rong, director of the Global Service Center for Quitting the Chinese Communist Party, which leads the campaign soliciting renunciations from the Party, issued certificates to Sun Hongyan, Mr. Li, and 17 others. She expressed her appreciation for what she characterized as their spiritual awakening. “Chinese people are making the right choices for themselves and for China. Thanks to this spiritual awakening, fundamental changes are happening every day in China,” Yi Rong said. Before the rally, Vice President of the European Parliament Edward McMillan-Scott, Lithuanian Member of the European Parliament Laima Liucija Andrikiene, and Estonian Member of the European Parliament Tunne-Valdo Kelam issued a joint proclamation in support of the Global Service Center and the Tuidang movement in general.